Cystic fibrosis afflicted lungs support the growth of many bacteria rarely implicated in other cases of human infections. We report the isolation and identification, by 16S rRNA amplification and sequencing, of two emerging pathogens resistant to colistin, Brevundimonas diminuta and Ochrobactrum anthropi, in a 17-year-old woman with cystic fibrosis and pneumonia. The patient eventually responded well to a 2-week regime of imipenem and tobramycin. Our results clearly re-emphasize the emergence of new colistin-resistant pathogens in patients with cystic fibrosis. Cystic fibrosis (CF) is one of the most common autosomal-recessive hereditary diseases in Europeans and is characterized by disorders of the respiratory tract and pancreas, and exacerbations of pulmonary infections. A limited number of organisms are responsible for these infections, with Staphylococcus aureus and Pseudomonas aeruginosa being of primary importance. Recent studies, using molecular approaches, have identified uncommon bacteria and/or novel pathogens in patients with CF  including strains resistant to colistin such as Stenotrophomonas maltophilia, Achromobacter xylosoxidans, Burkholderia cepacia and Inquilinus limosus . While the frequency of infection with these species is believed to be relatively low and their significance unclear, they present a real challenge to diagnostic laboratories, as they are difficult to identify and often misidentified as belonging to the Burkholderia cepacia complex [1, 3]. We report the isolation and identification, by 16S rRNA sequencing, of two emerging pathogens resistant to colistin, Brevundimonas diminuta and Ochrobactrum anthropi in a 17-year-old patient with cystic fibrosis and pneumonia. The study was approved by the local ethics committee (IFR48). A 17-year-old woman with cystic fibrosis, and with diabetes and persistent colonization of the respiratory tract with Staphylococcus aureus since childhood was admitted in October 2006 to our specialized centre for a respiratory infection with dark sputum, asthenia, fever (38.5°C) and a loss of weight of 4.5 kg. On examination, the patient had shortness of breath and diffuse crepitations in both lungs. The oxygen saturation on air was 92% and her chest X-ray showed a diffuse bronchitis syndrome with bronchial distension in the right lung apex and left lung base. There was no pleural effusion. Relevant laboratory findings included a white blood cell (WBC) count of 18,380/mm3 with 82.8% polymorphonuclear cells (PMNs), a platelet count of 618,000/mm3, C-reactive protein (CRP) of 57 mg/litre, fibrinogen of 5.17 g/litre and whole blood glucose of 9 mmol/litre. An admission sputum sample was plated onto Columbia colistin-nalidixic acid (CNA) agar, chocolate Poly ViteX agar, MacConKey agar (bioMérieux, Marcy l'Etoile, France), CEPACIA agar, and SABOURAUD agar (AES laboratory, Combourg, France). Direct Gram staining of the sputa showed numerous PMNs (>25 cells/field), Gram-positive cocci, and infrequent epithelial cells (<10 cells/field). Apart from 107 CFU/ml methicillin-susceptible S. aureus, two different Gram-negative rods (oxidase and catalase positive) were isolated from CEPACIA agar at 103 CFU/ml after 3 days of incubation. Using API 20NE (bioMérieux, Marcy l'Etoile, France), two isolates initially identified as Weeksella virosa /Empedobacter brevis (Code 0010014, 84.5% probability) and Ochrobactrum anthropi (code 1641344, 98.9% probability) were definitively identified as B. diminuta (100% homology with B. diminuta strain DSM 1635, GenBank accession number X87274) and O. anthropi (100% homology with O. anthropi strain W24, GenBank accession number EF198140), respectively, after amplification and sequencing of the 16S rRNA gene as previously described . Although there is neither clear consensus nor guidelines for antibiotic susceptibility testing (AST) of these two bacteria, AST was performed using VITEK 2 Auto system (bioMérieux, Marcy l'Etoile, France) and disc diffusion methods. The B. diminuta was resistant to amoxicillin, amoxicillin/clavulanic acid, ceftazidime, ciprofloxacin, trimethoprim/sulphamethoxazole and colistin but remained susceptible to ceftriaxone, ticarcillin, ticarcillin/clavulanic acid, imipenem, amikacin, tobramycin, gentamicin, isepamicin, rifampicin, and piperacillin/tazobactam. The O. anthropi was resistant to amoxicillin, amoxicillin/clavulanic acid, ticarcillin, ticarcillin/clavulanic acid, ceftazidime, ceftriaxone, piperacillin/tazobactam and colistin but remained susceptible to ciprofloxacin, imipenem, amikacin, tobramycin, gentamicin, isepamicin, trimethoprim/sulphamethoxazole and rifampicin. The patient was initially treated with ceftazidime (2 g 4 times/day) and nebulized tobramycin (300 mg/day) for 2 weeks. The treatment was switched to intravenous imipenem (4 g/day) and tobramycin (320 mg/day) for 2 weeks with dramatic improvement. Two weeks later, the patient was clinically well and sputum culture yielded a mixed oral population. B. diminuta and O. anthropi were not cultured again in 5 sputa investigated during 7 months of follow-up. B. diminuta is a non-lactose-fermenting environmental Gram-negative bacillus previously assigned to the genus Pseudomonas (Figure 1) that has been occasionally implicated in clinical situations in immunocompetent and immunocompromised hosts including bacteraemia, urinary infection and emphysema [5, 6]. In a study by Kiska et al. , B. diminuta was isolated in a patient with cystic fibrosis, after being misidentified as B. cepacia, but the identification was not performed using molecular methods and the patient's clinical condition was not reported . O. anthropi is a Gram-negative non-fermenting bacillus widely distributed in the environment that has rarely been reported as a human pathogen. It has been implicated in several clinical situations in immunocompetent and immunocompromised hosts including osteochondritis, necrotizing fasciitis, endophthalmitis, cellulitis, sepsis, chest wall abscess, osteomyelitis, endocarditis and pelvic abscess [7–9]. O. anthropi is characterized by a broad spectrum of antibiotic resistance and is believed to be naturally susceptible to colistin  whereas there are currently no available data for AST of B. diminuta. It should be noted that our patient received a course of colistin to treat a A. xylosoxidans colonization 10 months before the onset of this pneumonia. This may have contributed to the selection of these two colistin-resistant bacteria in our patient. We believe that these two colistin-resistant pathogens were the main cause of her acute pneumonia. Although S. aureus may also partially participate in the pathogenic process, O. anthropi and B. diminuta were isolated during this pneumonia. Moreover, the patient did not improve initially with an effective antibiotherapy against S. aureus (ceftazidime) and improved using an effective antibiotic treatment against the two colistin/ceftazidime-resistant strains suggesting a role of one or both colistin-resistant strains as an agent of lower respiratory tract infection in this patient. Phylogenetic tree based on 16S rRNA sequences. 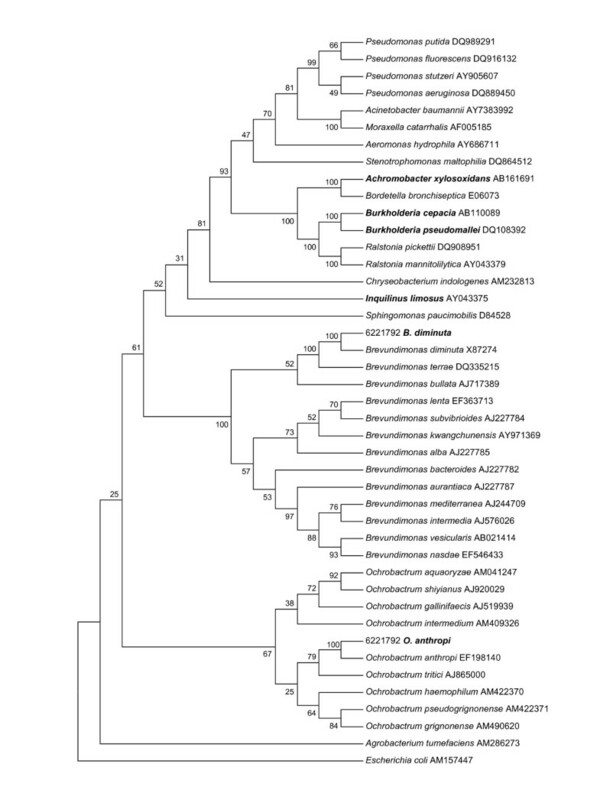 The information presented includes bacterial species or phylotype and GenBank accession number. Footnote: Bacteria that are given in bold have been described as colistin-resistant in patients with cystic fibrosis. Our results clearly re-emphasize the emergence of new colistin-resistant pathogens in patients with cystic fibrosis as recently reported for Inquilinus limosus . The increased clinical use of nebulized colistin in patients with cystic fibrosis may select specific colistin-resistant bacteria. Furthermore, the use of Burkholderia cepacia complex selective agar associated with molecular approaches may allow the identification of emerging colistin-resistant pathogens in patients with cystic fibrosis. We thank Paul Newton for reviewing the manuscript. This work was partly funded by the French Association Vaincre La Mucoviscidose (VLM). MM and FB collected the data and drafted the manuscript. NS, JCD and JS took care of the patient during hospitalization. DR and JMR participated in the design and critical revision of the study and helped to draft the manuscript. All authors read and approved the final manuscript.